In Kenya, the leading cause of amputation in people under the age of 50 is road accidents. Life was going well for Hillary Kiptoo at the beginning of August 2013. He was married, had children, and worked as a clinical officer (similar to a physician assistant) in Narok. However, by the end of the month everything changed. Hillary was involved in a road accident and through complications of his injuries, became an above knee amputee. After his wounds healed, Hillary was fitted with a fixed leg and allowed to resume SOME duties at the hospital he works. However, the accident and subsequent amputation left him significantly affected psychologically. This difficulty along with the limited mobility of the fixed leg system severely restricted what he could do at work as a medical officer. Hillary was given new hope for the future in July 2014 when he was fitted with the LIMBS prosthetic system. 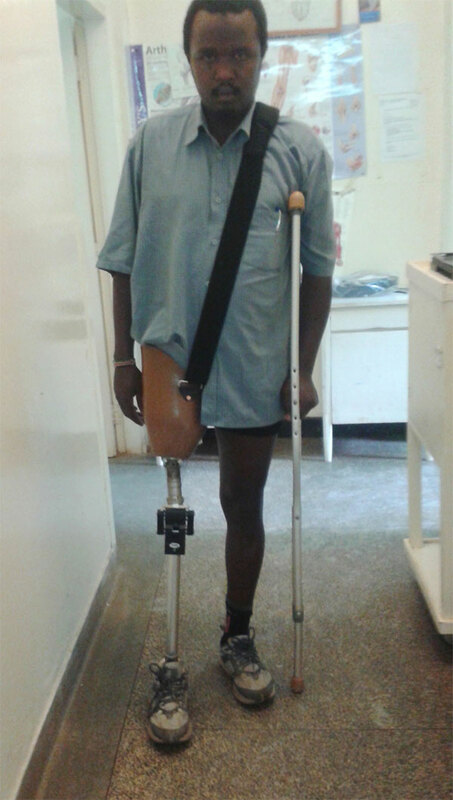 The LIMBS Knee allows him to walk more normally; boosting his confidence and giving him more mobility than he ever thought he could have again. Hillary looks forward to resuming his full duties as a medical officer soon and to once again helping those in his community instead relying on their help.